>Man, it’s been AGES since I blogged! Things have been kind of busy around here since I had Oscar. So, let’s see… um, Oscar is growing very well, and is doing wonderful. He’s a great eater and sleeper and has such a laid back, chill personality; very much like Jeff! 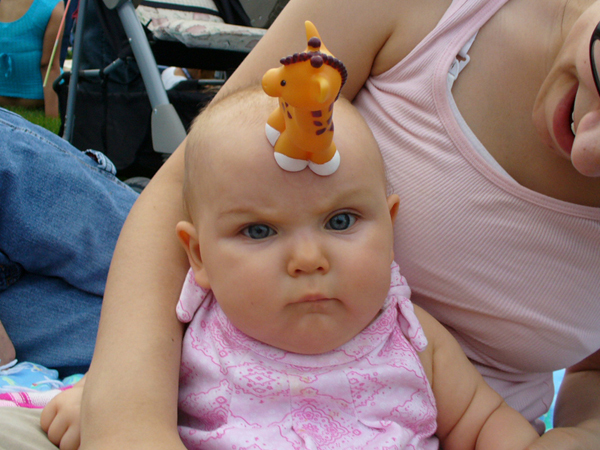 Something we did with the girls was stick a giraffe on their heads on their first Independence Day. Obviously, we had to do this with Oscar too! I love all three of these pictures; I plan on maybe getting a picture frame that holds three pictures to put all of these pictures together. But the various reaction between the three just shows me how different they really are. Being a mom to three kids is honestly MUCH easier for me than having two kids. I’m not entirely sure how or why; and that will probably change once Zoe starts Kindergarten; because then for a few hours of the day for 5 days a week, I’ll just have two kids at home. It’s going to be hard on Ruthie I think more than anyone else since Zoe’s been a constant in her life since the day she was born, and while he’s cute and fun, Oscar doesn’t do much. I’ve been feeling content with the number of kids I have, and I KNOW for certainty my family is now complete; everyone that’s supposed to be here are here. Oddly enough, cloth diapering is going much easier than I had anticipated. There’s been a few hiccups along the way, but I’m seriously thinking to myself; “This is way easy and so much better than having to worry about disposable diapers! I’m getting closer and closer to my driver’s license! I’ve done 3 observations with the driving school and one driving time; I have two more scheduled for next week. And after discussion and weighing the pros and cons we’ve decided that I will take the driving test with a private company versus going to the DLD/DMV. I’m hoping this will all be done by August 1st; however I’m not entirely sure if that will happen. At the very latest, I need to have it by August 10th; that’s the day that kindergarten registration is. That’s in three weeks; I KNOW I can do it! Once life catches up I’ll be able to blog more. >Since I’m a pretty active follower of cloth diapering blogs, and I of course follow cloth diapering moms on twitter, I was having a conversation with one the other night.. she was up later than usual and asked if anyone was on, and I said of course.. it’s amazing how much you can squeeze into a short blurb! Anyway, she shared her daughter’s birth story with me, and it dawned on me I never posted mine online with either of the girls. She had expressed interest in reading my birth stories, so of course I’m now writing them out here; I’m going to start with Zoe’s since she was born first. The first reason is to share my stories of course, but the second reason is to kind of help me process both of their deliveries and kind of help me know what I want with Oscar’s birth. Thankfully I had the foresight to type and print up Zoe’s birth story and printed it out and put it in her scrapbook so I’m gonna refer back to this to type it up. It was over five years ago! I had contractions start up a few days before Zoe was born, but it wasn’t until November 23rd that they were bad. I remember we had gone to run some errands at Linens ‘n’ Things, and Target. I don’t remember why we had gone to LnT, but we had gone to Target to pick up drinks for Thanksgiving dinner the next day. I remember walking around the stores and having contractions, but it wasn’t until we were checking out at Target that I told Jeff I needed to sit down, since the contractions were kind of getting strong. After we checked out, we drove over to Sonics to get some Route 44-sized Strawberry Limeaids.. let me tell you those things are so many levels of epic. Jeff started to get tired at around 9:30 so we went to bed, and something told me to lay a towel on the bed, so I did. I curled up on my left side and was reading Harry Potter and the order of the Pheonix, and then around 10, I felt a trickle. I thought it could have been my bladder leaking a bit, since I had just finished drinking a huge beverage in a short time. So I got up to go to the bathroom, and as soon as I relaxed to pee, I felt this huge gush of fluid and then this loud wet plopping noise.. and I looked in the toilet and saw this huge white blob… apparently the gush of amniotic fluid dislodged my mucous plug in one piece. So I woke Jeff up and told him my water broke, and of course he had to ask “Are you sure?” and I was of course VERY sure. So we got dressed and toodled over to the hospital. So after getting hooked up to monitors and whatnot, the nurse tried to test the fluids that were on the chuck pad I was resting on and then vaginally swabbing, but they all came back negative. The nurse called the doctor on call and he said for her to use her own judgement. I think she didn’t really believe that my water had broken, and in the middle of her spiel about first time moms not knowing what’s going on, I felt this trickle of fluid so I cut her off and said “I’m leaking fluid again.” so she uncovered me quickly and visually confirmed that I was in fact leaking amniotic fluid, and so they transfered me to a labor and delivery room. Of course, after I was getting transfered, that’s when I started leaking fluid like crazy and was leaving puddles everywhere. At around one in the morning, my contractions were starting to get uncomfortable, and after being prodded into it, I decided to go for an epidural. I was able to get some sleep after that, but then because I was moving around so much while I was asleep it had slipped out a bit and had to be redone.. not sure what time it was when this happened. The scary part was not being able to move my legs. AT ALL. It sucked because when I shifted positions, I had to either have Jeff move my legs for me or I had to call in a nurse. I don’t know how people who are paralyzed deal with that on a daily basis, my hat seriously goes off to them. Anyways, my inlaws showed up at the hospital at around 10 am, and they were fully expecting to be home not too long after that. It was fine and dandy for a while, until around.. I’m wanting to say 10:30 or so, the epidural machine died, and I spent the rest of my labor unmedicated. I’m assuming it had died sooner, but it took that a while for it to wear off. I also remember moaning and even screaming, and they were telling me to ‘calm down and stop screaming’ which of course didn’t work. And then they also gave me oxygen.. not sure why though. I had initially wrote, “Women who chose to have natural labor should have their heads examined; it was extremely painful!” (I’ll address this later of course) Oh, and I threw up at this time too. A lot. I’m not sure what caused it.. since I know they heavily dosed me with pitocin, so it could have been that, or it could have been the shock my body went through when I went from pain free to experiencing natural labor. Our bodies are made to deal with the gradual increase of pain, not going from 0 pain to 10 in a matter of seconds. The doctor on call came in, and determined that while Zoe was head down, she wasn’t completely posterior facing, and manually turned her to face down properly. This was not fun I tell you that. So then, he came back a while later and said I could start pushing. Being a first time mom, I don’t think he expected me to progress so quickly beacuse he came in after 20 minutes to check on me, and was surprised at how fast I was progressing. 25 minutes later after that, Zoe finally came into the world at 12:19 pm. I’m not gonna lie. The OVERALL labor was good, but the actual birth and delivery was bad and somewhat truamatic. I was kind of pushed to have an epidural, and of course it crapped out on me twice. I realize now too in hindsight the ignorance of my comment about women who chose to have natural birth. I think had I been mentally prepared to experience the pain, it would not have been so bad. In addition, I think the epidural wore off during transition, which according to my reading is the most painful part of labor. Oh, and the delivering doctor was HORRIBLE. He had terrible bedside manners.. he was short and rude with me, and then when they put Zoe on me to clean her off, he and the nurse chewed me out for wanting to help clean her off, and they both kept telling me to stop touching her, and I think at one point my hands were moved off of her. In addition, he YANKED my placenta out without any abdominal massage, and I’m pretty sure when I started crying too loudly, I heard him tell the nurse “get her to shut up.” Maybe he said quiet down, I don’t remember. And then, since it was traditional for the doctors in the OB group to give out baby shirts, I remember him throwing my shirt at me and then walking out. I still have the shirt, but for reasons unknown, I never put Zoe in it. I’m grateful though that I had a lactation consultant come in right after Zoe was born, and we were able to establish breastfeeding pretty quickly. Zoe nursed like a champ and self weaned at 1 year old. I guess what I can take away from my birthing experience with Zoe, is if you’re gonna have an epidural, at the very least request fresh batteries with the drip… my epidural crapped out the second time because the batteries had died and by the time they had figured it out, it was too late to start it up again. Oh, and if you have a bad delivery, don’t hesitate to bring it up. The doctor that delivered Zoe was NOT my OB, and I had the misfortune of getting him because he was on call. Thankfully now though he’s retired, so no more women will experience having him deliver their babies. Do I have PSTD from my birth with Zoe? No. Parts of it bothers me and I wish I had been a bit more educated, but I know it could have been a lot worse. I took my experience with Zoe, and made sure certain points of my labor were better with Ruthie.. and it was. But more on her birth story later. >Which means the closing of another year. Each year between Christmas and probably the first week after the New Year, I always sit back and reflect on the past year, and contemplate the upcoming one. Unfortunately I have not blogged much this year for various reasons, but I’ll try to blog and highlight the ups -and some downs- of the past year. The other highlight was getting pregnant for the third time in July.. of course we didn’t confirm the pregnancy until August! The miracle and blessing of being able to get pregnant is still just as fresh and marvelous with Oscar as it was with Zoe and of course Ruthie too. This past year or so, I’ve had family and friends who have lost their pregnancies at various stages, and even one friend who lost her child just mere days after the baby was born. There’s no words to describe the sorrow and heartbreak of these situations.. while I’ve never experienced the losses they’ve gone through, that doesn’t mean my heart still didn’t break when hearing about each loss. Each one of the women are all fantastic mothers, and it’s really not fair they’ve had to deal with the losses they’ve dealt with. I admire each and every one of them for their resolve. I’m grateful for every kick, poke and yes even the muscle pulling and popping because I know what the alternative means. This pregnancy has been a double blessing, because I have been able to finally get answers for all of the inexplicable aches and pains and weird falls and other episodes that I’ve experienced for most of my life with the diagnosis of my Rheumatoid Arthritis. I’ve got a friend who has it, and I contacted her and she gave me an emotional boost and some advice as well as the title of a book that she recommends reading; I’m going to have to buy it soon. In addition to the blue and green diapers, I also have red and yellow. And one crazy lime green one. Next week will mark the one year anniversary of us having Casey. I can’t even begin to express how.. interesting it’s been with him in our lives. It’s certainly enriched it for sure! He’s a GREAT dog.. even when he gets stuck on the roof at my inlaws’ house or runs up the street and comes home with a rawhide bone he didn’t have before -for the record he only did that ONCE-. We don’t have a fenced in yard… but that doesn’t matter. We can let him out by himself and he won’t run off -well he’s done that twice in the last couple of weeks but he always came home after calling for him- and he ALWAYS stays in the yard when we’re outside. He’ll find himself a patch of ground and lay out and just watch and observe, and of course he’ll play if we got his stuffed duck or a few tennis balls outside. He NEVER dug in the garden, and with the exception of digging a very small hole once this summer to bury a milkbone, he doesn’t dig up the yard or anything. I think the truest test of his character was back in November, when he somehow sustained a 5-7 inch gash on his back/side that went all the way down to his muscle. We’re unsure how it happened, but we think he was trying to get under the chain link at my inlaws’ house, and it went unnoticed because their female had tended to it by licking it and it had started to close up and scab over. We didn’t realize anything had happened until the next day (Monday) when Ruthie had leaped on him and reopened the wound.. and shockingly all he did was cry out in pain, look at her and walked off. I didn’t think anything of it, until Zoe said “Mommy, Casey stinks.” and then about a minute later “Casey has something on his fur.” Looking at it from about 12 feet away it looked like he had rolled in poop -something he’s never actually done, but there’s always a first time for everything- and it wasn’t until I saw the pink flesh of his muscle that I knew something was wrong. I told Jeff he had to come home IMMEDIATELY and I took a picture and sent it to him via picture messaging. One stressful trip to the vet and $400 later, he was put under for surgery, stitched up and given a good bill of health. What was alarming though was the rate of necrosis.. the vet said that it was consistent with a week old stab wound.. despite the fact that the injury happened within the previous 12-16 hours of him getting medical attention. He is probably the best dog to have around kids, because the girls are constantly pulling and laying and just generally rough with them and he hasn’t ever really snapped or bit them.. and I think most people say that about their dogs, but when the dog has a big gash on them and a kid that weighs about 30 pounds comes flying and flopping on them, even the most mild mannered dog will retaliate by snapping at them or even biting them. The vet was shocked when we told her what his reaction was.. or lack of one really. Jeff and his dad inspected the chain link fence that he was trying to get under, and they found a VERY sharp piece of fence that we think he cut himself on. When the weather gets better, they will be going and clipping the fence to make sure it doesn’t happen again with Casey or any other dog. I’d insert a picture.. but I’ll spare you from regurgitating your last meal/snack that you ate; it looked pretty bad. And I feel horrible about slacking on the pregnancy belly pictures.. honestly I haven’t been feeling well enough to do it, but I FINALLY had Jeff take on on Christmas! Hope you enjoy! and of course, I’ll be taking more. I promise I’m not grumpy, just EXTREMELY tired. This pic was taken on Christmas after all! I’m 24 weeks and 5 days along in this picture. Anyway, hope you enjoyed the update with pictures! Hope you guys had a good holiday and that you’ll have a GREAT New Year! >At 12:19 pm, after 14 hours of labor -most of which I slept through- I gave birth to my firstborn, Zoe Elizabeth Hayford. I don’t know if I’ve ever mentioned it before, but her name has some significance to Jeff and I. We both selected Zoe due to the fact that we’ve never heard of anyone using the name, except that Jeff did have a teacher that named his daughter Zoe. We had the name picked out before we found out that she was a girl; however, it took us several weeks to decide on her middle name, until one day we were driving home from somewhere, and I asked Jeff, “How about Elizabeth?” and he asked where I got the name from, and I replied, “It was my imaginary friend’s name.” Apparently, I had named my imaginary friend Elizabeth when I was about 2 or so.. to this day I have no clue where I picked up the name from. Zoe was unplanned; but she was NOT unwanted. Due to being diagnosed with Endometrosis at the age of 16, I went the next three years assuming that I wasn’t going to ever be able to get pregnant without medical intervention, and even then that was far reached; there was the remote and very real possibility that I was never going to even have children at all. I discovered that I was pregnant with her when I was approximately 10-12 weeks along.. and that’s a long time to realize something was off, but a side effect of having Endometrosis is that your periods are extremely irregular. Her birth was a tremendous blessing for me, because I knew that without any help from any doctors, I defied the odds and was able to conceive naturally. Never have I taken the ability to have children granted. While I love my kids with equality, Zoe’s most special in the sense she was truly a miracle, especially after what I was told. In addition she was also born on Thanksgiving, and also on my inlaws’ 34th wedding anniversary. 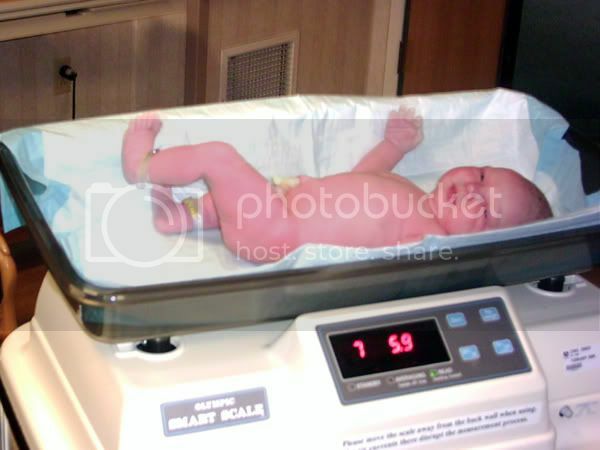 Nothing can beat the birth of a grandchild as an anniversary present! She was 20.25″ long. Doesn’t look too happy does she? And here’s what she looks like today.. and when I say today, I mean within the last 15 minutes. Happy birthday Zoe! I can’t believe you’re five, time has surely flown by! Yeah, that’s correct. It’s a picture of Jeff (left) and me. And there’s NO above our heads. Apparently, no parents are allowed in their room*. The N is a bit lopsided, but it’s very clearly a NO. Amazing.. Zoe’s nine years away from being a teenager, and already this. Well, we always knew she was advanced for her age. *BTW, she still actually lets us in; however her door has to be shut during the day for some reason. >This is actually our first year of doing Easter with the whole works. Last year, the girls got baskets, but that was about it, considering we had just moved into the apartment easter weekend, so we were too busy to do anything else. But this year in addition to getting baskets, we colored eggs; well just me and Zoe did, Jeff was busy fixing something at the time so he didn’t participate. Here’s us coloring eggs. Zoe did such a great job scooping the eggs carefully out of the dye cups and placing them down on the paper towel to dry, and she also helped mix up the dye to color the eggs. Here’s Zoe holding her egg with her name on it. 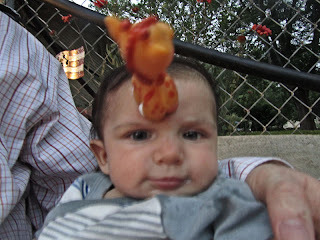 We also did an egg for everyone in the family, as you can see. Here’s all the eggs we colored. We did boil all eighteen eggs that were in the carton; however three of them cracked while boiling, so instead of coloring those, we just ate them. Here are the girls’ baskets. The Easter Bunny decided to leave the baskets outside of their bedroom doors. The pink one is Zoe’s, and the purple one belongs to Ruthie. Zoe thought the Easter Mr. Potato head was awesome, so awesome that she liked it enough to be embarassed by liking it so much; something that happens quite frequently. She usually hides herself or just her face if that’s the case, and she hid under her table for about 5 minutes before we told her to come out and look at it. Ruthie got two Easter themed Little People toys. We had Easter dinner at my SIL Melissa’s house. It was supposed to be at Jeff’s parents’ house, but the heating element went out in her stove so she wouldn’t have been able to cook dinner. Anyway, Melissa has a row of daffodils in front of her porch, and Zoe LOVES to pick flowers, so she picked a daffodil and like with all flowers.. she had to smell it! I also love the expression on her face in the second picture; especially because somewhere we have a picture of Jeff with the exact same expression on his face, and I’m pretty sure it was a picture taken on Easter as well. I’m not completely sure if I remember the picture correctly; but either way it’s pretty funny. Anyway, I hope everyone had a wonderful Easter. >It totally slipped my mind to post this last week, but the girls had a joint checkup last Wednesday; Zoe for her three year checkup, and Ruthie for her nine month checkup! It’s amazing how time has flown with two kids, I thought it would slow down, but in all honesty, it’s sped up. And I’m SO glad that they did NOT get any shots, what a relief that was. Anyway, Zoe first. Now I honestly don’t know if it’s because I’m just short or other kids are shorter, but I’ve honestly not met a child as large as Zoe at her age. For example, the only other girl child I’m around constantly is my future sister in law’s daughter Cirena, but Cirena is almost four. She’s not that much taller, if not shorter than Zoe, and is a wispy little thing. So are most kids under the average for their weight and gender, or is Zoe really just average and I never really noticed before because they weren’t my kids? Zoe is a solid and sturdy little kid, even if she does trip alot. But like our friend Cooper said one day when he came over, “When does she start school again?” Uh, not for another three years Cooper. Well, this is when the comparision starts between the girls. I honestly don’t remember Zoe’s weight all too well at nine months, but I’m pretty sure she was at least 29 inches. Zoe was a longer baby, but when I put her old 18 month old pants on Ruthie (Zoe wore them at a year) there was less drag on the pants when Ruthie wears them, so her length must be in her legs, but Zoe’s must be in the torso, something she got from Jeff’s side of the family; since most of my height -what I have of it- is in my legs. Ruthie didn’t gain much weight from her last appointment, but since her last appointment, she’s learned how to crawl; which would indicate toning of muscles and lost of some fat. She’s still chubby, and does have rolls in her legs and arms; however she does NOT have anywhere near the ammount of rolls that Zoe had. The doctor didn’t worry about it all, he said it’s quite normal. Obvously, our address isn’t included. I had the foresight to realize I’d most likely be posting it here to share, and I don’t want my address publicly floating over the internet. The rest of the email had our address, directions on how to find our apartment and even a small map! And because I know you’re wondering, that’s a sticker of the earth on her nose. >Well, here’s part two today! As promised, I got some awesome Halloween pictures. It was a really nice -for October in Utah- night out; however it was sprinkling outside but it wasn’t that bad. It really brought out the fall smell. We went to our friends house up in Kaysville, and here’s a picture of the girls sitting on their fireplace. Here’s a closeup of the girls. It’s really hard to get them to cooperate at the same time. Still a cute picture even if Zoe’s making a funny face. Here are Zoe and Rafe holding hands. Cute picture! Rafe was so cool, he needed TWO trick or treating bags/buckets. Here’s Zoe in the ‘trick or treating’ zone. She was having alot of fun. Unfortunately the picture isn’t the greatest one. Zoe LOVES to color. Unfortunately, we haven’t had the foresight to buy her any coloring books or any new crayons or colored pencils lately since she breaks the crayons everytime we give them to her. She took my prismacolor colored pencils a while ago and was intent on coloring with them, and after we firmly told her to give them to me, the face she pulled was HEARTBREAKING. She was just so sad and upset I teared up looking at her. So I’ve been letting her play with my stamps and she’s pretty good about keeping them in one place and not getting ink all over the place. She also wanted to color the stamped images she did so I found some broken crayons in various places and gave them to her. And well, last week when I wasn’t looking she colored all over the blinds leading out to the patio. I caught her again doing it and after telling her not to do it, she got the same look on her face, which has strengthen my resolve to get her some type of coloring book or something next time we’re at the store. Anyway, Zoe decided to take pictures of her ‘artwork’. Here’s a zoom out of what she did. I should mention she somehow marked ALL of the blinds. I should mention that ZOE took this picture as well as the one below! And here’s a closeup. I know I need to clean it off, but at the same time, I don’t have the heart to. I’m a weird person like that. I should also announce that Ruthie now has TWO TEETH! The first one broke out around August 26th, and the second broke out between Sunday, September 14th, and Monday, September 15th. She was EXTREMELY cranky that night and by the morning her tooth was poking out. Here’s the first picture of her with just one tooth. What a pretty smile! She was so happy since this was the first picture. I tried a few more, but she kept getting grumpier and grumpier everytime that flash went off. This one was just taken a few minutes ago while Jeff and Zoe were at Hollywood getting some new movies. You can see her two teeth easily! And I don’t know if you can tell in these pictures, but her hair has really lightened up since she was born. She’s also got a good head of fuzzy hair, which is WAY more than Zoe did at this age. Zoe was still a baldie until after her first birthday. We’re not sure what color Ruthie’s hair will be a this point, but it’s pretty obvious it’s not black, but it’s not blonde either. It’s taking on a reddish hue so who knows.. I may get my red headed baby after all! Unfortunately, I don’t have any recent pictures of Zoe since she likes to take pictures versus having pictures taken of her. However here are two that have been taken in the last month or so. Here’s one she took of her feet. Zoe has an unusual talent with taking pictures of random stuff and them coming out well. I guess she wanted a picture of her pink toenails. She’s extremely obsessed with toenail polish and fingernail polish; if it’s chipped she freaks out and wants me to reapply polish for her. Here’s one of Zoe vegging out in front of the TV. I’m not sure what she’s watching, but I love how she’s munching on shredded carrots. She’ll go into the fridge, get something out and eat it. I usually have to remind her to put it back when she’s done though, but she LOVES when we have fruit and stuff for her to eat. She’ll request candy if we have it but usually it’s fruit or veggies of some type. Zoe has a well balanced diet; people are completely amazed at what she’ll eat especially when their kids eat very little stuff or are just stuck on the good ole “chicken nuggets and cheetos with juice” diet.